The Kyocera Hydro REACH icomes with a 5-inch qHD display. Powering the device from within is a 1.1GHz Quad-Core Qualcomm Snapdragon processor with 1GB of RAM and an internal storage of 8GB. The Hydro REACH has a 5MP rear-facing camera and a 2MP front-facing camera. It is powered by a 2,160 mAh battery that gives it its needed battery to live up to a full day on a single charge. 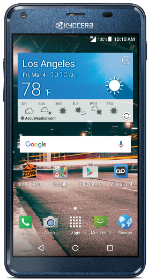 Upon release, the phone runs the latest Android 5.1 Lollipop OS. The phone is waterproof and dustproof and comes with Wet Touchscreen Operation. I would never recommend this phone to anyone. The only good thing I can say about is that it is water proof. It isnt durable at all. I had my phone for less then 6 months and was so happy to get a replacement phone. The phone wouldnt charge right for the last few months, it hasnt charged properly. I have had it shut off while having a charge and wont turn on for a day or two. When i call Kyocera company they wanted to charge me for shipping and handling of the phone and said i may not have it back for up to 2 weeks. I know money can be an issue for so many people but please dont waste it on that phone spend a little more and have a reliable phone.